Financing and Rent to Own options also available--Call us for more information. 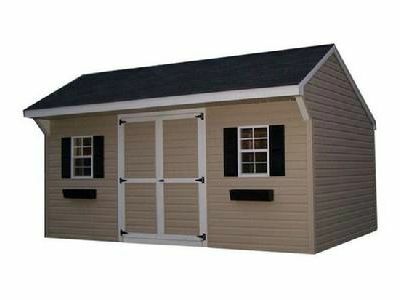 Let Good’s Garden Sheds customize a shed to your specifications! The carriage has a 20 inch overhang on the front side allowing this design to have protection for the doors and windows from wind and rain. The steeper pitched roof, decorative design, and neat workmanship, make for an attractive and long lasting practical solution for your storage needs. Keep in mind that a loft may not work as well with this style, unless you add 1 ft taller walls.